Forklift accidents cause somewhere between 85 and 100 fatalities worldwide each year. On top of this, on average, there are 34,900 accidents resulting in serious injury and 61,800 non-serious accidents. Friday 14th June 2013: A driver in the USA caused $250,000 worth of damage when he split a hose valve while placing a 4 ton roll of metal in a storage rack. Tuesday 30th July 2013: An explosion at the Blue Rhino Propane factory causing $3 million worth of damages and left 5 fighting for their lives in intensive care. It believed to have been started by a spark from a forklift. Friday 19th July 2013: A Tasmanian court finally awarded a man left quadriplegic $7.4 million after a workplace forklift accident in 2009. These are just some of the accidents that occurred in the past year involving misuse of forklifts. There were also several fatalities in Australia this year from forklift accidents. As mentioned above the number of accidents worldwide everywhere is in the tens of thousands. It is not just on the open road that seatbelts can be lifesavers, the use of seatbelts in forklifts can also save lives. 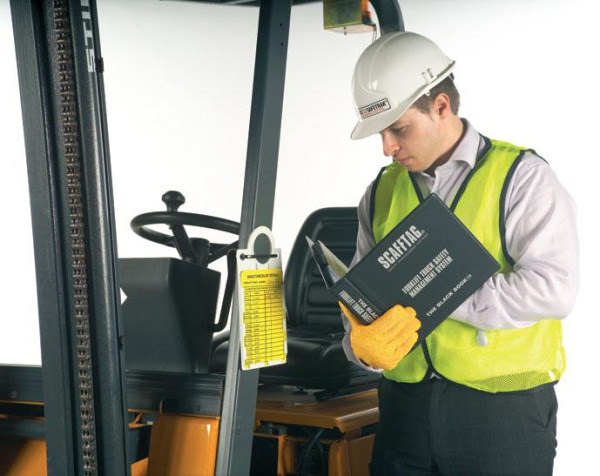 The major lifesaving function of a seatbelt in a forklift is a different role to its normal use for impacts. Seatbelts in forklifts are most useful when the machine tips over. Of all forklift fatalities, it is estimated that 42% come from tipping vehicles, where often the operator jumps out. In their attempt to escape the vehicle, the operator gets caught and crushed under the vehicle or load. By requiring all operators to wear seatbelts and keep them on, in the instance of tipping you can drastically reduce the risk of casualties in your workplace. Along with wearing seatbelts drivers should be trained to lean away from the ground in the case of tipping, for example, if they are falling left they should lean right and vice versa. Simple rules such as these can save lives in the case of an accident. Training has an important role in all facilities and particularly those that use forklifts, it can prevent or reduce the severity of accidents related to tipping and all other incidents. Instruction should include more than just a basic teaching of operation; it should include safety procedures, best practices and emergency situations. Having a list of things that need to be remembered in a well frequented area such as the cafeteria door or main entry door can also be a good tactic to constantly remind workers of their training. It is important that all your equipment is functioning well. The average useful life of a lift truck is on 6 years, after that, lift-trucks can become dangerous for the operator and all those around it. This length varies across different machines for several reasons outlined below. The difficulty of the task it must perform. For a further example, electric forklifts have a longer life due mainly to having less moving parts, and one that had low hour usage on it would last even longer. 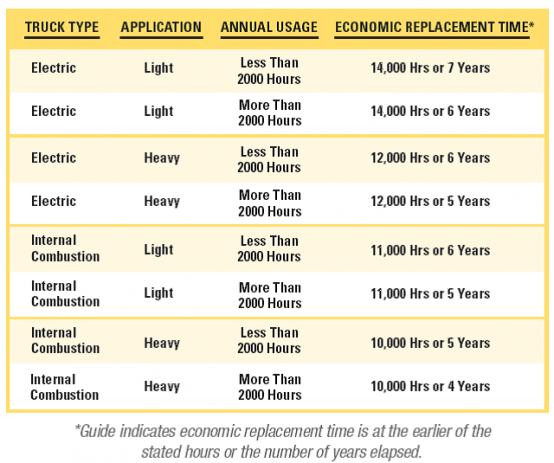 Below is a chart by Hyster, a forklift manufacturer, that gives an average lifespan of several different types of forklift. If your equipment is not functioning at its optimum, you essentially put your facility at risk of accidents. To avoid this, a regular maintenance schedule should be established in your workplace. Keeping your equipment in good condition can benefit your entire warehouse and your bottom line. By having your forklifts in good condition, you reduce downtime, minimise risks of accidents and ensure high performance and profit. Wide Lanes: These are crucial in reducing collisions both between vehicles and with the racks and vehicles. Narrow lanes demand more from your drivers and can cause serious problems. Bollards, Guard Rails and Bump Rails: These can be useful in protecting important parts of the warehouse and rub points. They reduce the chance of damage and wear and therefore extend the life of both your lifts and your facility. You should put bollards around things such as door mechanisms or high traffic pedestrian areas. Signage / warning devices: Use signs, convex mirrors, reflective markings to provide better visibility for predestrians and equipment operators. For more on creating a safer warehouse, refer to our blog on the complete traffic management checklist. The elements discussed in this article make up a small part of a much larger safety plan and training program for the use of forklifts in your warehouse. To delve further into the safety measures in relation to forklifts, read our report below.